Reports of the ground uplift at Yellowstone have been in the news of late, and whilst this has slowed over the last few years, it is still high enough to be of concern. This is not such an unusual occurrence and has happened many times before without causing an eruption. However, the fact that there is sufficient pressure under Yellowstone Park to do this is something of a worry. At the moment the ground covering the Yellowstone supervolcano seems to be strong enough to withstand the pressure, even though it is causing an uplift. But what if something were to happen to change this? Whilst many hundreds of earthquakes are recorded at Yellowstone every month, these are usually very small and unlikely to create any problems. But a much larger quake at (or maybe near) Yellowstone could trigger the release of magma to the surface and produce an eruption of unknown size (maybe even a VEI 8?). It just so happens that a number of earthquakes have appeared in the region in the last 24 hours, one as large as magnitude 5.2. Whilst this is not as large as some of the quakes we have seen in other places, it might be sufficient to set off an eruption if it occurs in the wrong spot. Eruptions of supervolcanoes (VEI 8's) are very rare, the last one was seen 26,500 years ago (Lake Taupo, New Zealand), and it was 640,000 years ago that Yellowstone saw a super eruption. The Taupo eruption plunged the Earth into a volcanic winter and is believed to have wiped out an estimated 60% of the human population. Those closely connected to Yellowstone say there is nothing to worry about and an eruption is not expected. If the uplift continues to slow (or fall) and no large earthquakes occur, I would agree that there is no danger. But who can predict this? Unfortunately, even if an eruption (of any size) is imminent, there is very little that the authorities can do, except evacuate residents closest to the caldera (if there is time). To hint about the possibility of an eruption would only cause panic and endanger the financial stability of the United States, so this would never happen until it is absolutely certain an eruption will take place. 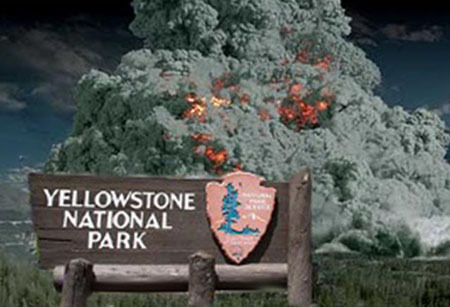 A VEI 8 eruption at Yellowstone would produce a massive death toll in the surrounding areas initially, but it would also effectively put the US out of business. The rest of the planet would not escape the devastation, as the volcanic ash began to circulate in the atmosphere, creating an ice-age for many parts of the planet. It is of course frightening to picture such an event, especially when you know that it will take place at some time in the future. The only unknown factor is when? The UFO Cover-up explained in just 10 minutes! Can you help confirm whether HAARP is responsible for the recent Bird and Fish deaths? Latest MoD UFO files not complete – More proof of a cover-up?